This list contains best free greeting card maker software for Windows. You can use these freeware to make special occasions of your loved ones more special. Using these software, you can create greeting cards for various occasions, such as birthday, wedding, Christmas, thanksgiving, etc. Most of these software come with some built-in templates. You can choose from these templates to create greeting cards. Many of them even let you browse desired image(s) to decorate greeting cards and write greeting text with adjustable font style, color, size, etc. 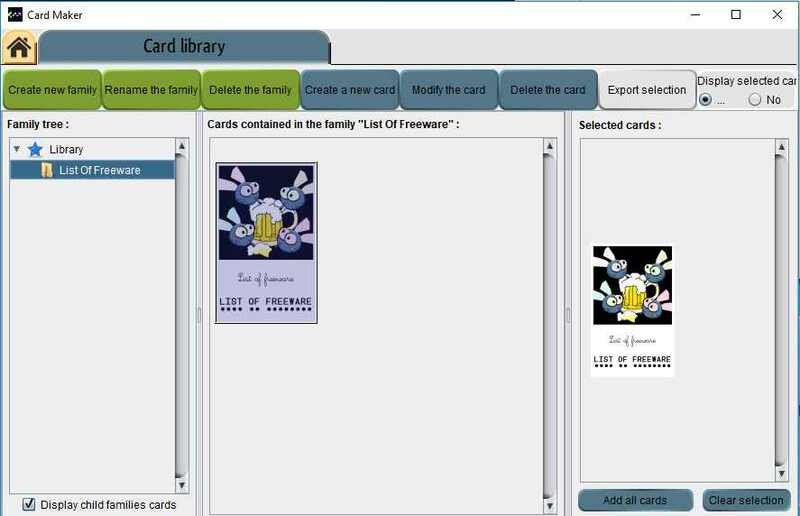 Once the card designing is finished, you can save it in a local folder on your PC, or export it in supported file formats. One of the important features of these software is that, they support multiple file formats to import/export cards. Some of these formats are JPG, PNG, BMP, TIFF, GIF, etc. In some of these greeting card designer software, you can also export designed greeting cards as PDF. In this run-down, an app is also included. Using this app, you can create, and share greeting card instantly. It doesn’t have too configuration options, but it lets you generate a shareable link, and add a sweet default music to your foldable digital greeting card. At the end of this article, you will find a link to download templates to design greeting cards. You can use these templates to design greeting cards in some of the most popular image manipulator software, such as Paint.net, GIMP, etc. Photo Card Maker is one of my favorite greeting card designing software. You will find many templates in various categories. Also, it supports a number of image formats such as BMP, PNG, JPG, TGA, JP2, and TIF. In addition to that, it also lets you add some greeting text. You can also view some best free business card maker and watermarking software for Windows. Photo Card Maker is a free greeting card maker software for Windows. It is an easy to use software to design beautiful greeting cards for your loved ones. It comes with some preloaded templates categorized in various classes, such as cartoons, Christmas, holiday, seasonal, sport, travel, etc. You can use any of these templates as background for your greeting card. It also lets you import more templates using ZIP files. Moreover, you can also browse photos stored in your PC to use them in greeting cards. Besides this, it also allows you import photos in multiple formats including BMP, PNG, JPG, TGA, JP2, etc. Multiple font styles are available in the software to choose from. You can also vary font size and color as per requirement of your greeting text. When you are done, you can save your design in one of the following supported file formats: BMP, JPG, or PNG. Card Maker is also a good alternative to greeting card design software for Windows. Using this software is a cake walk. Just browse an image into the software and add a custom text to it. Go through the following instructions to create greeting cards. Image Import: Browse and select your favorite image to start designing with. Word Input: Write some greeting text for the recipient. Family Selection: Specify the output folder. Summary: Preview your designed greeting card here. Now, as greeting card designing is completed, you can choose ‘Export’ option, or save your design as JPG, or PDF file. McPaw Card Designer is another free greeting card designing software for Windows. Using this software, you can design greeting cards having either of the three predefined card sizes, that are: 4″ x 7″, 5.5″ x 4.25″, and 10″ x 7″. Like some other listed software, it also lets you import images to use them in greeting cards. The image formats supported to import files are BMP, GIF, JPG, PNG, ICO, EMF, and WMF. You can specify the outline of these imported images either as rectangle or ellipse. There is also an option to change the rotation angle of inserted images. You can adjust the position of inserted image by entering values for X-Y coordinates, or by dragging them. To give a personal touch, you can add some greeting text in different font color and sizes. In addition to picture insertion, it even lets you insert different kind of shapes like rectangle, line, arc, pie, etc. with desired border color, width, and gradient. You can also capture desired portion of screen to use it in your greeting card. After completion of greeting card designing process, you can save the file in PDF format, or print it. LibreOffice is another software that can be used as a free greeting card maker. As you open this software, you will be able to access various utilities offered by this software. To design a greeting card, you need to choose its Draw Drawing option. Now, a new application window will open and let you design greeting cards. You can download various templates from different sources and use them in this software to design greeting card for different occasions. Also, you can insert Image(s) available in your PC in this software to design greeting cards. After inserting an image, you can adjust its various parameters such as brightness, contrast, color mode (grayscale, black and white, etc. ), position, height and width, etc. It also lets you add some greeting text with different font style, size, color, etc. After completing greeting card design process, you can save it in the local folder of your PC. It supports a wide range of file formats such as BMP, JPG, GIF, PNG, TIFF, etc. It also lets you export cards as PDF. Card Creator is a free, standalone software to design greeting cards. It is one of the easiest software to create greeting cards. To create a card, you just need to open this software and select a template to design a card in that template style. Now, just add photos at shown positions in the selected template. That’s it. Initially, it comes with only three preloaded templates, but you can add more templates by downloading them from its site in RLI format. It lets you save your design in JPEG, or PNG format. Greeting Cards Express is a free Windows app to design foldable digital greeting cards. It is a very handy app. Using this app, you can select a template available in it, as per suitable occasion, and associate custom text with it. There are a lot of templates in this app. These templates are divided in various categories such as anniversary, birthday, congratulations, love, thank you etc. After selecting a template, it lets you write some greeting text. This text will appear on the folded page of the greeting card. This application even lets you add a default background music to greeting cards. After completing greeting card designing, you can have a preview (in browser) of designed card to check out how it really looks. Finally, you need to choose ‘Create Short Link’ option, to generate a shareable link. Thus, it makes creation and sharing of foldable digital greeting cards, an easy task. Paint.NET is one of the most versatile image editing software available for Windows, and it’s also free of cost. So, you can also use it as a free greeting card maker software. All you need is to download templates. After that, you can add multiple layers of images to that template and create beautiful greeting cards. Also, you can apply many other features such as text insertion, color reduction, etc. available in Paint.net to customize greeting cards. To design greeting card for different occasions, you need to choose respective type of template. You can download some free templates here. After downloading templates, you can also use GIMP software to design greeting cards.